The small stream setting provides a unique fishing experience compared to larger rivers or lakes. Find a shorter rod, I use a 6ft, 3 weight with a short leader, and a dry dropper rig. It is important to pack light and keep compact, so you can better get around the underbrush. A smaller rod helps you avoid snagging every cast, while you're standing in a shrub fishing a body of water that’s 3 feet wide. When testing out streams, leave the waders at home in favor of hiking boots. Stealth and patience are your friends when the water you're fishing is maybe 3 feet at the deepest hole. Dab casting is often times necessary, for lack of spatial freedom, and introducing a fly authentically to the water. Just as in larger bodes- plunge pools, ripples, and seams are productive. Whenever I go out, I am usually looking for any trout, in my heart I am a trout man, but anything that takes the fly will do. Though what I'm really looking for is secluded steams, oxygen rich, cold and clean water and productive habitat. The author shows us that fishing small streams requires different techniques than larger bodies of water. Small streams are usually ignored as fishless runoff. While it may not be blue-ribbon water, it should not be ignored. For me, it is the purest form of flyfishing. You are going to a place untouched, untampered with, and interacting with pristine streams as they were intended to be. Water that may not have been fished since the 1950's. You are more likely to bump into a moose than another person. What keeps me exploring is the solitude, and to prove there are places unsoiled by man- Who knows when the tall cedars surrounding a mountain stream will be clear cut next season. It's spiritual in a way, and beats the hell out of rubbing shoulders with 15 other fishermen on a popular waterway. You get to see things that haven't been seen while proving that there are fish still living in these healthy environments, and that’s something we should be protecting for the next generation. 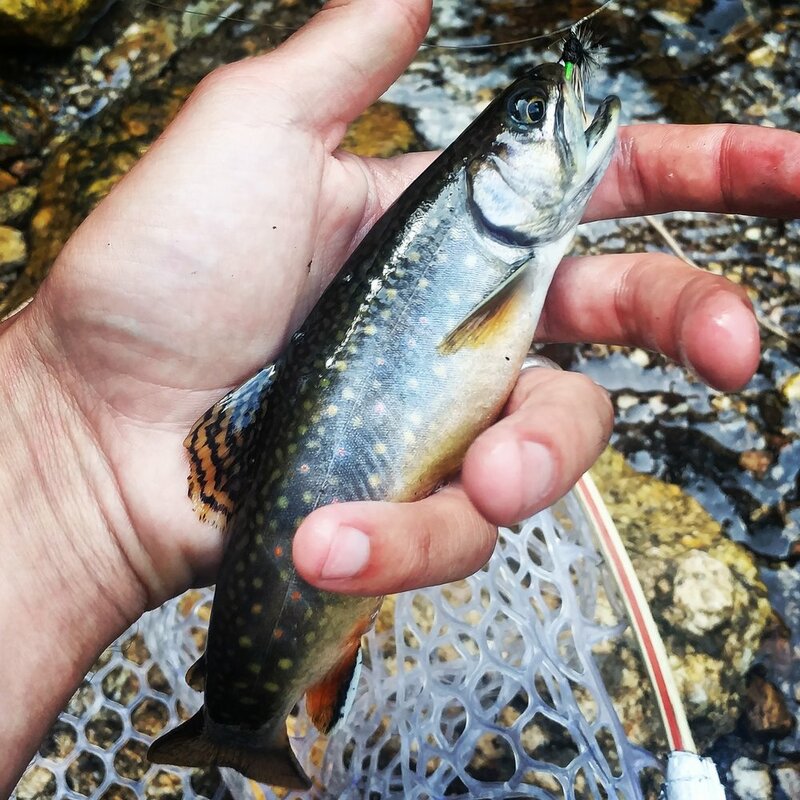 There is no better feeling than climbing up a big densely forested hill that opens up to a creek with a pod of brookies trying to swim up a beaver dam, or a bunch of small parr marked redbands (trout) hiding under a log jam. It's like something you only seem to see in movies. Perhaps people forget that it still exists (but is getting harder to find). It's important to see where everything comes from, and it all starts in water like that. When it comes to flyfishing as a hobby, everything trickles down- if you don't see the start, you will never understand the rest of it. When it comes to conservation, we should start at the top. We will lose the individual and unique beauty of these creeks, and we will see the damage work its way down. Not just with fish, but the bird and beetles, insects and hawks, and finally, people. Streamside vegetation provides habitat and clean, cool water.